*Sadly most of the pictures for this post are no longer available. Sorry about that. Anyone else admire beautiful beverage stations? Just staring at the varieties on Pinterest warms the winter wimp in me. I wanted to replicate the idea in my own home but didn’t want to crowd the kitchen counter tops. Here are five tips that helped me accomplish this goal so we can stay warm and sip hot drinks all. day. long. 1. Label as necessary. I can’t resist a pretty label, or any label for that matter. I know many of you feel the same. The following picture isn’t really a label, but it’s a related printable I made to embellish my station. By the way, the power of suggestion is amazing. As soon as I displayed this sign in our kitchen, I noticed my husband drinking more hot beverages. With the exception of marshmallows, most of my drink station options are healthy to enjoy. Keeping green tea at my fingertips on a snowy day warms me right down to my popsicle toes. 2. Contain it. Yep, this step really matters. A contained station makes an organized station. I used glass square shaped containers with air-tight lids. They keep out unwanted elements and the unique shape allows to maximize small spaces by fitting closely together and stacking easily. If you prefer plastic, OXO Good Grips provides a similar non-breakable option. The great thing about the OXO brand is that some are designed to block UV rays from destroying the contents inside, specifically for protecting coffee and tea. While we’re talking containers, I even contain my containers to make it both organized and eye appealing. 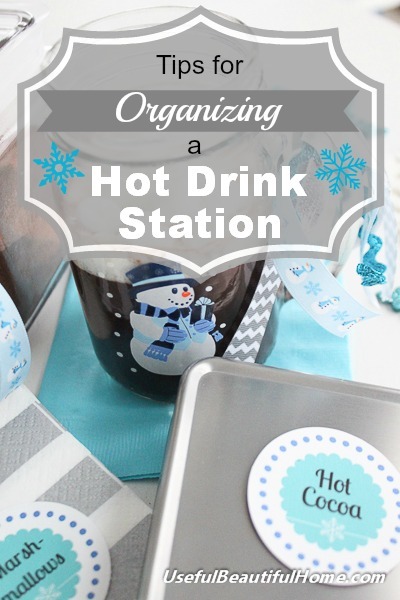 Since we drink a lot of hot beverages during the cold months, I wanted this station convenient on the counter tops without appearing like random clutter. I found this wooden bin at Homegoods to hold all my square shaped jars. Rectangular shaped works better than circular because it fits snugly along the wall and is long enough to hold all the jars within eye sight. As a bonus, the extra space hides my protein drink mixer. Remember to look for a bin that has a flat bottom surface, which will keep your jars from toppling. 3. Make it applicable for daily use. Include your most frequently used hot drinks and accessories. My family has a wide variety of likes and dislikes, so our hot drink station holds many options; tea, coffee, Emergen-C packets, hot cocoa, marshmallows, etc. The point is to include what is frequently consumed but nothing more. 4. Make it convenient. I don’t have room to dedicated a piece of furniture solely to a hot drink station, but I did find space on my kitchen counter top. I parked our hot drink station close to mugs, spoons, and napkins. Most of those items remain behind closed doors where they normally reside. While I love the idea of everything out in visual sight, it looked cluttered when I tried it myself. In the end, this is what works best for my kitchen. 5. Make it morph. My drink station is for permanent use. IMO, designing something to last all year long makes it worth the effort. I actually started this station last summer by filling it with smoothie and protein drink opinions. 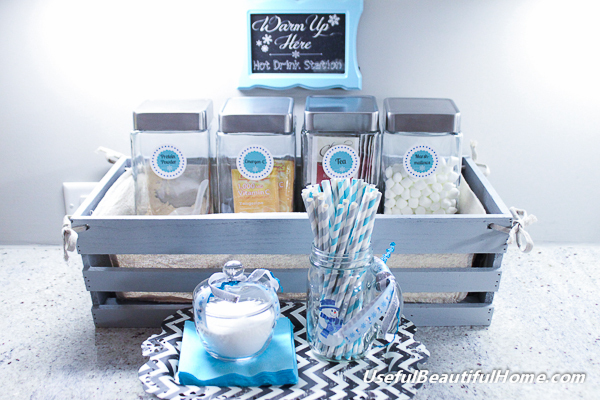 In the upcoming Spring, I’ll show you how this beverage station transitions from hot to cold. Another way I morph it is to add beverage condiments when company comes to visit. I don’t usually make an entire display like you see in most of these pictures. My every day set-up includes just the basic jars labeled & corralled in the wooden container. However, with a few small additions it upgrades easily for entertaining. Quick tip: fill a small decanter with demitasse spoons when entertaining. The carafe or decanter is actually meant for serving individual portions of wine but the shape is perfect for an upright spoon holder. Cheers to staying warm this chilly season! 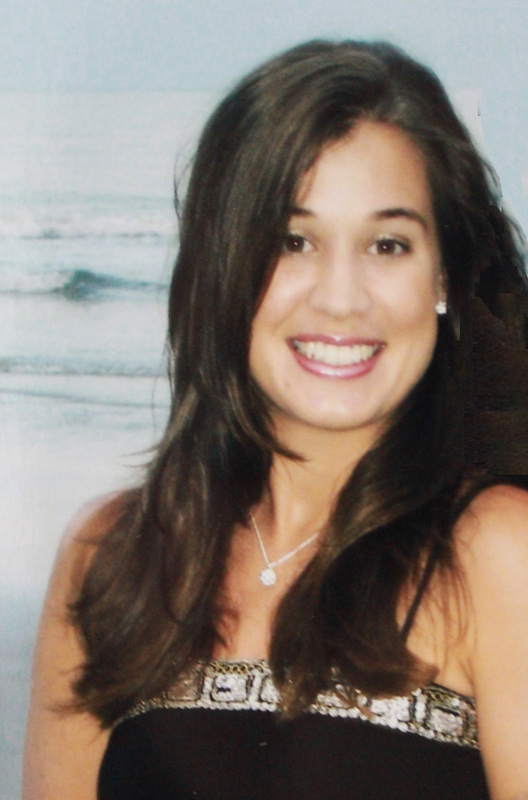 In the professional world, I’m a nurse by trade. But, around our house, I’m known as Mommy to our young daughter. My two worlds collided and began shaping into a blog. Useful Beautiful Home represents the hours I’ve dedicated to managing my household as efficiently as possible. I offer you motivation to keep your home healthy, organized, and welcoming. My goal is to share what I’ve implemented in my home to inspire you with fresh ideas and to encourage you to keep up the good work in yours! There is something powerful about labels. They are both the sign of an organized mind, and they help support organizing our mind. Labels are one of the simplest ways I know to make sense of the world. I really need to do this. Currently, my mugs are at one end of the kitchen, my teaspoons at the other, and the kettle and coffee making equipment in the middle. Just not sure how to rework it yet.